“Heaven on a half-pipe” is a skateboarding colleague’s description of this show, the 51st All-Japan Mokei (Japanese word for ‘Model’) Hobby Show, held on 13-16 October at the Makuhari Messe, Chiba, Japan. 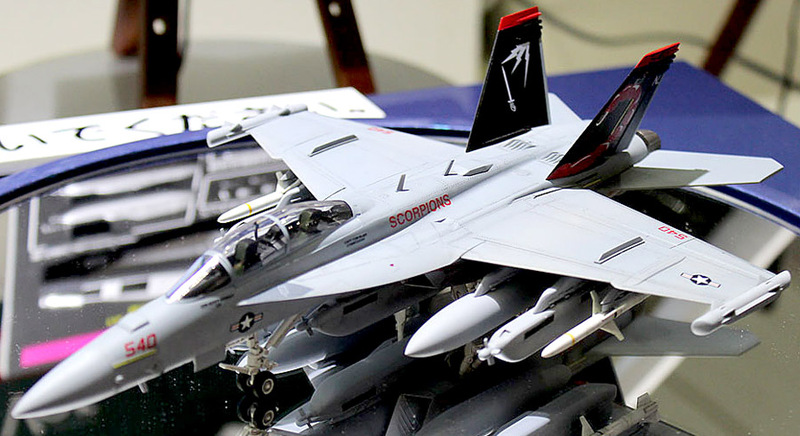 Today is the last day of this mega-display of talent in the miniatures world, where companies vie to present new products, especially those being released over the next few months. Here’s a snapshot of what’s on the menu. 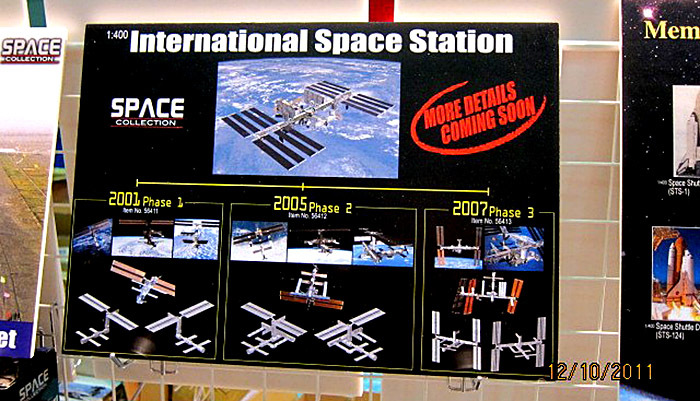 Star spacecraft kit is the Moon probe Kaguya (Selene), while other good stuff includes the 1:350 scale Japanese Navy cruiser Takao, and Honda NSR250R bike in decently big 1:12 scale. 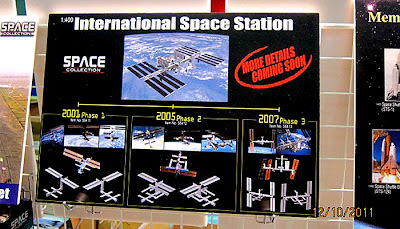 High points on the Dragon stand include a 1:400 scale ISS International Space Station, and a 1:72 scale de Havilland Sea Vixen. Watch this space tomorrow for test shots of the Sea Vixen. Formula 1 racing fans should be well pleased with Fujimi’s Ferrari F10, and there’s yet another 1:72 F-15E Strike Eagle for air modellers. In the full-size world, it’ll be interesting to see whether this wins against the new-design stealth F-35 in the current Japanese Air Force competition. 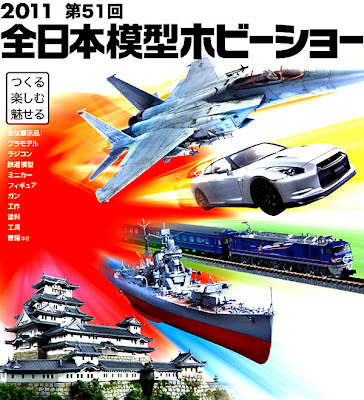 More warships from Fujimi with the Japanese Navy aircraft carrier Hiryu in two scales, 1:350 and 1:700. Star Wars fans rejoice, with a dinky 1:144 scale Slave 1, which comes in two versions. Mind you, we reckon neither the Boba and Jango Fett ships on offer here would win a space-race against our black-ops superluminal blockade-runner, constructed at the spaceworks hangar at SMN Towers. More Ma.K sci-fi from Hasegawa with a hunter-killer robodog, the Grosser Hund (“Good boy... Now bite him, Rover”). F/A-18 fans will be pleased to see a 1:72 scale model of the EA-18 Growler, the electronic warfare version of the US Navy Super Hornet, this one reduced from Hasegawa's earlier 1:48 model. 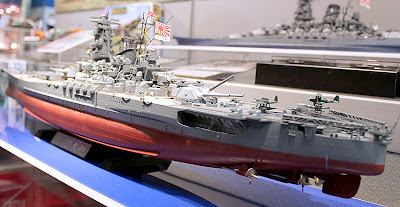 Headline act at the show is the superb 1:350 scale Yamato battleship, an icon to Japanese naval warfare fans, and the basis for a hugely successful sci-fi series featuring a space-going version. The original Yamato and her sister ship Musashi were the largest battleships ever built, and the Tamiya version is packed with detail, including rotating gun turrets. 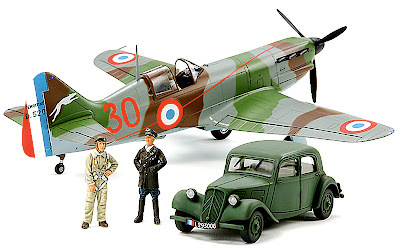 Our favourite new item is Tamiya's four-piece ‘French Aces’ set, featuring a 1:48 scale Dewoitine D-520 fighter, Citroen staff car, plus pilot and officer figures. Neat and unusual - an instant diorama, so well done Tamiya. There are various photo-reports around, and here's a selection. First off, a look at Gundam robots, fascinating for the sheer invention shown. Keep an eye open for our favourite, the one with big blue balls (!) on its shoulders! Visit here. Pix courtesy manufacturers, AMHS, Hobby Search.